Today I put my Heavy Seas Gold Ale clone into bottles. I ran out of bottles before I ran out of beer, so I put the leftover into a growler and chilled it to accompany our dinner. Colleen and I are both looking forward to it maturing over the next three weeks — it’s a promising brew at this stage. After I was finished bottling, I decided to give the yeast a bath to clean them up after their boozy party. Yeast washing is a procedure for recovering the yeast from your brew so that it can be reused in future brews. The idea is to repeatedly swish up the yeast and trub in pre-boiled water (which both sanitizes the water and purges it of oxygen), letting them settle into separate layers, and then pouring off the yeast and water from the proteins and hops in the trub. Most guides out there recommend two iterations: letting the slurry sediment once in the fermenter, and then letting it sediment again in a jar, before finally transferring it to the jar it will be refrigerated (not frozen) in. While some homebrewing experts advise that washed yeast be used within 2 weeks, many homebrewers tell of reviving yeast as much as 6 months later. 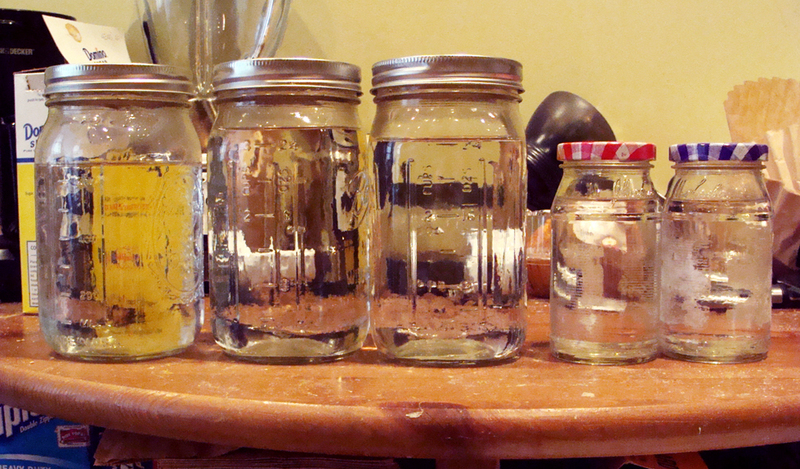 These are the jars I had on hand. Many homebrewers recommend using one large (approx. 1 gallon) jar and 4 pint-sized jars for storage. I boiled my jars for 15 minutes, sealed them, and put them in the fridge until they reached room temperature. I then sanitized a funnel, and added the water from the jars to the fermenter. After giving the fermenter a good swirling, I let it sit for half an hour. Supposedly one should be able to identify a layer of yeast sitting atop a layer of trub once the particulates have sedimented from suspension. 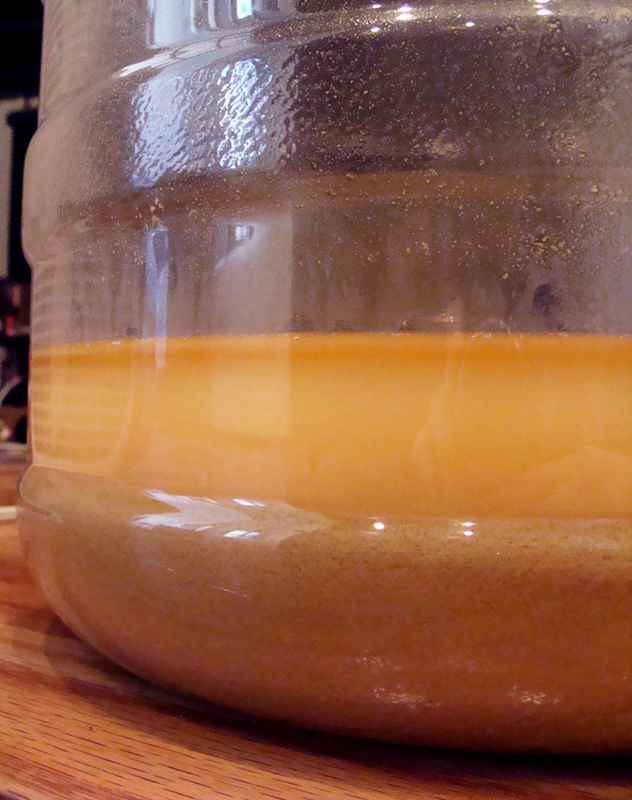 The yeast should be slightly lighter in color than the trub. The slurry from the fermenter is poured off into the largest jar, taking care to leave the darker layer of trub behind as much as possible while pouring off all the yeast. It seems the beasts have burrowed in! My slurry showed no such stratification. Nonetheless I forged ahead, pouring off a decent amount of trub into one of the mason jars just to be sure I got at least some yeast. There is of course still plenty of yeast in suspension in the liquid part of the slurry, but since I would be letting the slurry sediment again, I figured there was no harm in pouring in some trub. After another half hour had passed and the slurry had sedimented again, I poured off the liquid and part of the sediment (until I thought it started to darken) into yet another mason jar. 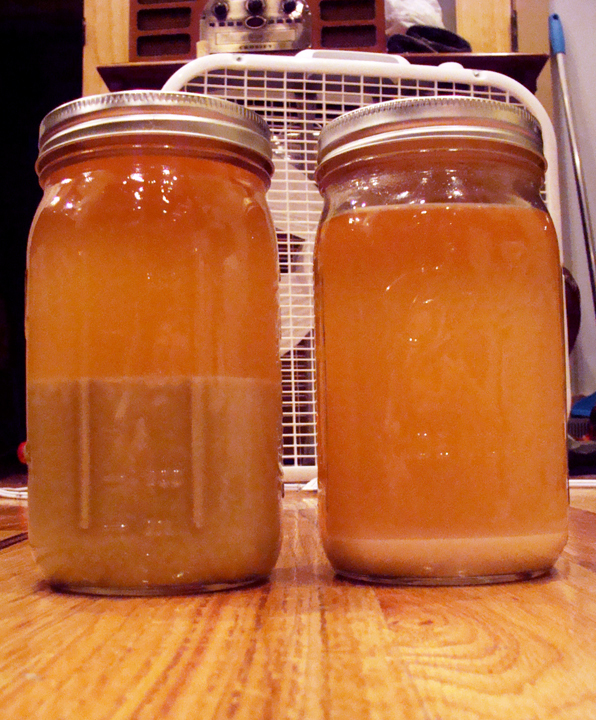 I then put that jar in the fridge and refilled the mason jar I’d just emptied with slurry from the fermenter. It was around this time I took to the internet for a little more research about yeast washing and why I might not be seeing stratification. A paltry harvest for the effort, but enough to let me brew on. It turns out that a rather terrific scientifically-minded blogger, Steven Deeds, has conducted experiments on yeast viability and population density in the strata that form during yeast washing. He found that the ratio of yeast to non-yeast particulates is roughly constant throughout the slurry obtained during washing, so all the pouring off and sedimenting is for naught. Additionally viability of yeast is not appreciably improved by washing. He further found that yeast washing can actually be detrimental, due to the fact that bacteria populations are higher in the upper strata of the slurry, and so by discarding what is commonly supposed to be trub at the bottom of the slurry, one is actually selecting yeast that is more contaminated with bacteria (and possibly also selecting the least flocculent yeast). Therefore he recommends simply stirring up the slurry in the fermenter and saving it in its entirety in jars. The yeasty yield will be an order of magnitude greater and take less care and effort. Given my experience today, I think that is what I shall be doing in the future from here on out. I’ll be using some of this yeast on Tuesday for my next brew, and hopefully also employ it in some baking to see how fresh brewer’s yeast stacks up against dried baker’s yeast. This entry was posted in beer, learning and tagged bottling, gold ale, golden ale, heavy seas, yeast, yeast washing on March 23, 2013 by Dylan Bargteil. Cool idea. I have read that you can cultivate yeast from your favorite brewery if they leave any yeast in the bottle. You absolutely can! I think it would be a bit beyond me right now, as it technically involves culturing yeast, rather than just storing a large population of already active yeast. Culturing yeast requires very careful sanitary practices, and while it would be really awesome to brew with the same yeast that some of my favorite breweries use (provided they don’t filter their beer), I probably should improve other parts of my brewing before putting in so much effort towards that particular detail. This was really interesting! As it happens, yesterday I started some mead, and experimented with reusing yeast from a previous (banana wine) brew. I simply saved the gunk from the bottom of the fermenter and put it in the fridge with some sugar to keep it going. Stratification happened after a day, and two weeks later there was still evidence of slow activity, Yesterday I shook the bottle to mix everything up, and put 10-15ml into ~1 litre of flavoured honey liquid. The yeast seems to have taken to its new home well. And it’s been much quicker to wake up than the native yeast (i.e. the stuff already in the honey (so far I’ve only used native yeast for my mead (which so far is delicious and quite alcoholic!))). What I think you’ve actually done is called making a starter, where you introduce some dormant yeast (from your old fermenter) into a sugary environment so they start reproducing again (probably the slow activity that you observed). This is exactly what I made my stir plate for, to aid in giving the yeast more oxygen for reproduction in a starter. Starters get the fermentation going much more quickly because you’re typically tossing in a larger amount of already active yeast that will happily go on fermenting rather than having to be rousing themselves. I thought you were fermenting the mead with brewer’s yeast. Was that actually one of the bananas? I’m excited to try the mead! Thanks for mentioning my blog! You are doing some nice work here. Blogs like yours have helped me immensely in learning to brew and developing a scientific perspective towards traditional homebrew wisdom.